The graph below gives information about international tourist arrivals in five countries. 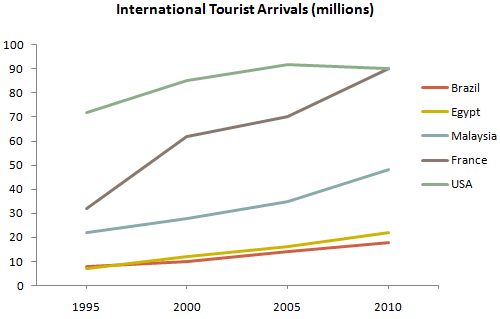 The graph shows the overall numbers of tourist arrivals in five countries between 1995 and 2010. In 1995 over 70 million tourists visited the United States, more than twice as many as the next most popular destination shown, France. However, between 2005 and 2010 there was a decrease of approximately 1,500,000 in the numbers going to the United States whereas there was an increase of nearly 20 million tourists visiting France. The result was that in 2010 the number of tourists arriving in the United States and France was almost equal at around 90 million each. The number of tourists visiting Malaysia rose steadily over the whole period but by 2010 the total was still under 50 million. The countries with the fewest tourist arrivals were Brazil and Egypt. The number of tourists going there was similar between 1995 and 2000 but after that there was a greater increase in tourists going to Egypt than to Brazil.